Home giveaway Our “Family Time, Happy Time” Getaway & Giveaway, the sequel! Our “Family Time, Happy Time” Getaway & Giveaway, the sequel! This is a sponsored post from BlogHer and McDonald's. Our “Family Time, Happy Time” Getaway, Review &As mentioned before the official theme of our McGetaway weekend was "Family Time, Happy Time." 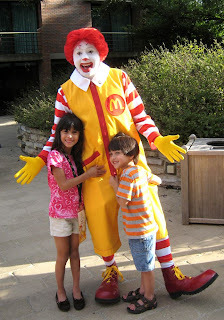 The McDonald's staff was kind enough to include our spouses and children on this trip, for a true family trip. F&B had a blast and still want to know when we can go back to McDonald's! One of the questions asked on the trip was consistently, how do you spend quality time with your family? It's the big ways--travelling (we just got back from our annual summer trip to Canada to see my family, including 22 hours on the road), musical theater (we've got Shrek tickets for Faith's birthday), going out to dinner (Thai is a perennial favorite), teaching the kids to ski, things like that. We absolutely love to travel with our kids, we go home to Canada twice a year, where the kids get to visit family & friends, ski in the winter, swim in the summer, and most of all, hang out with my mom & dad & the collies. We've done road trips, cruises, tours, etc, and Shaun & I make it a point to take the kids right along with us, we don't like to travel without them. Maybe I didn't see that one cathedral in Russia that I really wanted to see, but I can picture my then 3-year old daughter playing on the playground in the park across the street from it. And it's the small ways--reading chapter books at night together before bed (we're currently involved in Hank the Cowdog), playing board games & card games together, our church life group & friends, our Tuesday night Wipeout watching time, swimming in the backyard, attempting to grow our garden, cooking & baking together. I'd much rather spend time with Shaun & the kids than anyone else. Now, where does this all fit into McDonald's? So glad you asked! As part of the company’s ongoing commitment to bring families together, McDonald’s launched a new national fundraiser in support of Ronald McDonald House Charities® (RMHC®). For each Happy Meal® and Mighty Kids Meal® sold in the U.S., a portion of the sales will be donated to RMHC – McDonald’s “Charity of Choice” for more than 35 years. Through the widget, you can pledge minutes or hours of activities with your family in celebration of what matters most – spending time together. We also invite you to join the conversation and share your favorite family activities with other families through the widget. You can then share the widget with your friends and family through Twitter, Facebook, and email. In addition, as part of this campaign, McDonald’s will donate 1 penny to RMHC® for every minute of time you pledge to spend with your family up to 1,000,000 minutes. Minutes and pennies are tiny amounts that, when added up over time, can make a big impact, so start pledging your family time! Why is Ronald McDonald House Charities so important? Check out last week's post and read about Faith's new little friend Lauren from our trip. As well, our real life friends in Dallas have told us of their stays at RMHC when they were traveling around the country for therapies and a diagnosis for their daughter. RMHC provides a safe, caring place for a family with a sick child to stay, so they can be close to their child and without having to worry about food and hotel bills. I can't even imagine being in a large city I don't know with a sick child and still having to worry about where to sleep, where to eat, and how to pay for it all. When we toured RMHC in Chicago, we learned that there are nearly 300 RMHC in more than 30 countries/regions around the world. They serve around 7200 families a day, which saves these families around $260 million dollars in hotel costs. Volunteers help provide meals for the families staying there, as well as help with other projects. Want to help RMHC and have a chance to win this week's prize pack? It features a Smile Totebag, a set of Happy Meal Toys, a $25 Arch Card, a McDonald’s Characters Vintage Tshirt, a Pen Buddy Notebook, an EOS Organic Lip Balm Multi-Pack, 16 oz Stainless McDonald’s Tumbler, and a Just Give Gift Card for any charity of reader’s choice. Go pledge family time on McDonald's Make Family Time Happy Time widget and let us know what you pledged in the comment section for a chance to win! Have a favorite family memory tied to McDonald’s? Share it too! You can also head over to McDonald's Facebook page to share too! We've added ours and will continue to do so, go add yours as well! Meet the other wonderful bloggers I had the pleasure of meeting on this trip and enter their sweepstakes too. I used the widget and pledged 90 minutes for a movie night with my family. I remember having a birthday party at McDonalds when I was a little girl. We already work with food banks, but we pledged more time to help. I pledged to create art with polymer clay for at least 60 minutes with the boys. I pledged 60 minutes to play board games with my family. We bought my son a lot of games for his bday and Christmas, and we really want to start a family game night, so this will help! I pledged 90 minutes to go to the library with my family although I could have pledged a whole day. We love it there. I pledged 120 minutes to go swimming - we leave Saturday for vacation, so I'm really pledging all of next week to relaxing, spending time with the family and not dealing with any work. I helped families in need by pledging 120 mins to take photos of nature w/ my family. I pledged to build a fort with my family for 40 minutes!! I pledged 60 minutes of arts and crafts with my girls....we'll head to Hobby Lobby tomorrow to pick up supplies...they'll be so excited! I pledged 2 hours to clean up my local park with my family. I pledged to spend two hours outdoors with my family. I pledge 30 minutes to play board games with my family and 30 minutes every night for story time. I pledged 120 minutes to go to the zoo! I used the widget and pledge 30 minutes a day to take photos of nature with my family. I feel this will teach us to literally stop and smell and take pictures of the roses! We have jack rabbits, all kinds of birds, frogs and squirrels close by to take pics of. I look forward to this activity and then getting poster prints made of them!